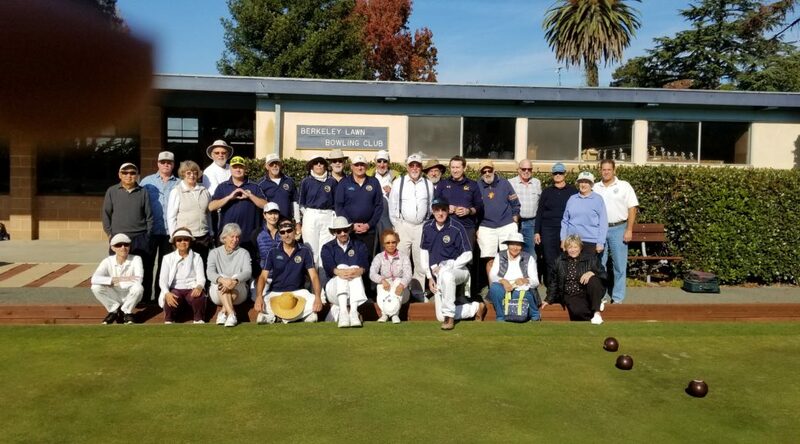 The BLBC “Rossmoor Challenge” is an annual match up of Berkeley bowlers against our friendly rivals on the other side of the Caldecott Tunnel. It is played in alternate years on each club’s green. This year, BLBC was firing on all cylinders. Under sunny skies Berkeley won by a score of 9 games to 1 (four triples matches and one pairs in the morning and the afternoon). Everybody from both teams had a great day, both socializing before the games and during the lunch break. We look forward to defending the “title” next year at Rossmoor. Thanks go to all who participated as well as the hospitality crew of Sarah Allday, Cathy Dinnean, and Susan Jamart who made sure a fine spread was set up in advance. The PIMD Novice Tournament is always a fun event, and a chance to see potential future champions in the making as those new to our sport strut their stuff, some entering their first tournament at this event. 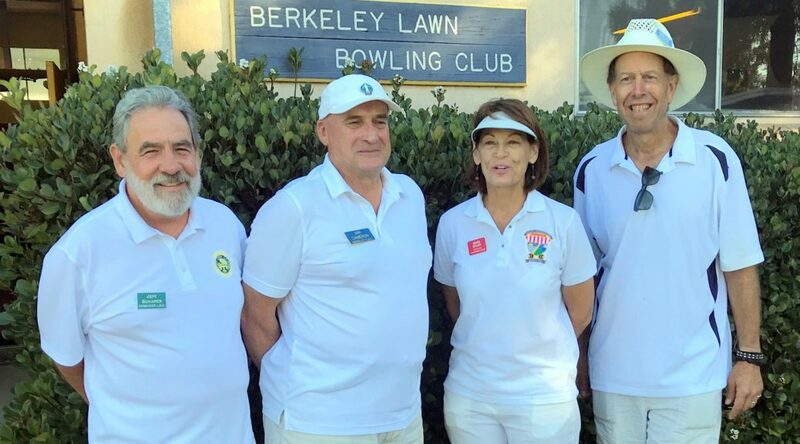 The 2018 contest, hosted by Berkeley LBC on October 6-7, was no exception. Twelve novices representing seven clubs competed over two days, with Jeff Schaper of Rossmoor LBC taking top honors. As a bonus, eight volunteer markers from five clubs helped keep the proceedings move smoothly. On Day 1, each novice played three games in singles format. The goal: be the first to win 16 points. 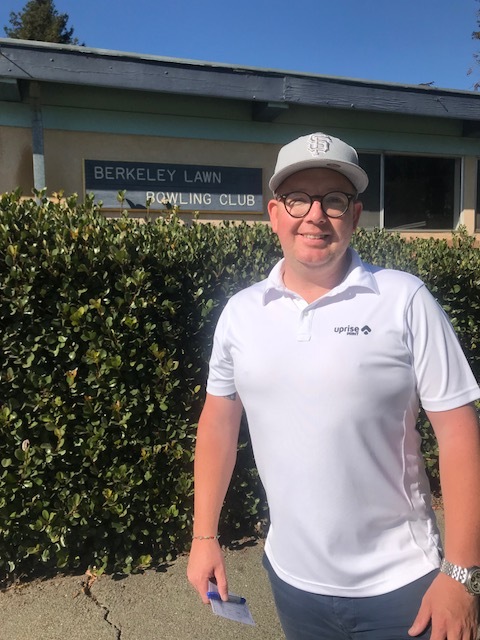 By the end of the afternoon, three bowlers—Rose Selby, Andrew Keeler, and Jeff—had won all three of their games, with Ian Cameron of Berkeley rounding out the top four after a nail-biting 15-16 loss to Jeff in the first match-up and a come-from-(well)-behind victory in the third game. Sunday’s format was a round robin, played in very hot and windy conditions. 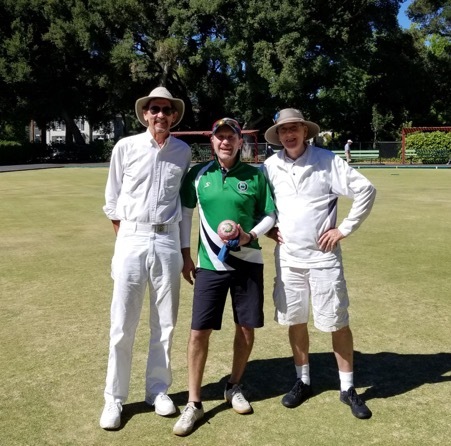 Again, Jeff was on top form, edging out Ian (again) 16-14 in the first match and going on to register victories over Rose and Andrew, thus being the only bowler to go undefeated over two days. Congratulations Jeff! 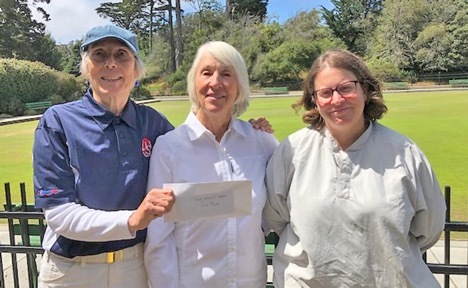 As always, events like this cannot be run without the contribution of many, including PIMD Tournament Director Bud Birkenseer, greenskeeper, Annie Brillhart, the markers, and, some might say most important (!) the hospitality crew who prepared the clubhouse and the green and supplied the coffee and tasty snacks for bowlers and spectators alike. Thanks to all. Our club hosted our first club tournament of the 2017 season today, the BLBC Singles tournament. All of you know that you don’t get any penny from winning this tournament…you get more than that…you get your name on the 2017 Winners Board at our club. 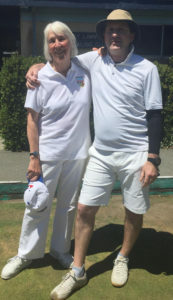 Differently from last year, the weather was perfect to bowl, not too hot, not too windy, and most importantly, also great for having a BBQ, and give Ray (the defending champion) and Shelagh a proper send off, since they will be soon departing for a very long journey across America. This year, we could only accommodate six rinks, so we had twelve bowlers competing for the title, including the defending champion, Ray. This year’s format was three 12 end games, with a differential limit of ten points, with the top two bowlers playing a 12-end final game. The contestants bowled two games in the morning, took a short lunch break and then bowled the last game. All games and bowlers had a marker (some even had their own designated marker) throughout the day, and it was a real pleasure to being able to focus on your game and not worrying about setting the jack or dropping it. Someone who knows that I am not very good at recalling things verbatim, may have said to me that marking is a job of love and, boy, we were very much loved today – so thank you Leslie, Sarah, Jim, Bob and Ann!!! Ann is also one of the PIMD umpires so she was on triple duty today! So back to the tournament. By the end of the last game, there were three bowlers, Rob, Cathy and Lennon who won all their three games, but Rob and Cathy had the same points differential (+22), and moved to the final game, which also showcased two markers, Sarah and Ann. It was a great game: both Rob and Cathy made beautiful shots, all of which were received with applause and compliments from all of us spectators. Rob took an early lead, but Cathy fought her way back into the game, and during the second half of the game, it was a one point game. However, in the end, despite her best efforts, Cathy couldn’t overcome Rob’s great shots and bowls, and the game ended 12-6 for Rob. After the game, we fired up the grill (thanks Rob for this idea, and thanks Erwin for starting the BBQ), and had hot dogs, chicken skewers, pork chops (thank you Cathy! ), veggie burgers, potato salad, cheese and salami, a delicious cherry pie, and lot of drinks and fun conversations. Huge thanks to Cathy, Ann and Sarah for setting up the club house, getting rid of the weeds near rink 1 and 2, and providing plenty of coffee and snacks throughout the day! Thanks to our Tournament Director Shawn and Ann, our Assistant Tournament Director – today’s event was a great success, and we all had a great time, before, during and also after the games. Congratulations to all the bowlers who bowled and participated to this event today and to Rob Hoey, the 2017 BLBC Singles Champion! The John Ogden Memorial Winter League is a fun but highly competitive tournament held each year during the bowling “off season.” John was a much-loved bowler, who, with his dad Woody Ogden (a US Bowls Hall of Famer), organized the tournament for many years. John passed away a couple of years ago and the tournament, originally the San Jose Winter League, was re-named in his honor. 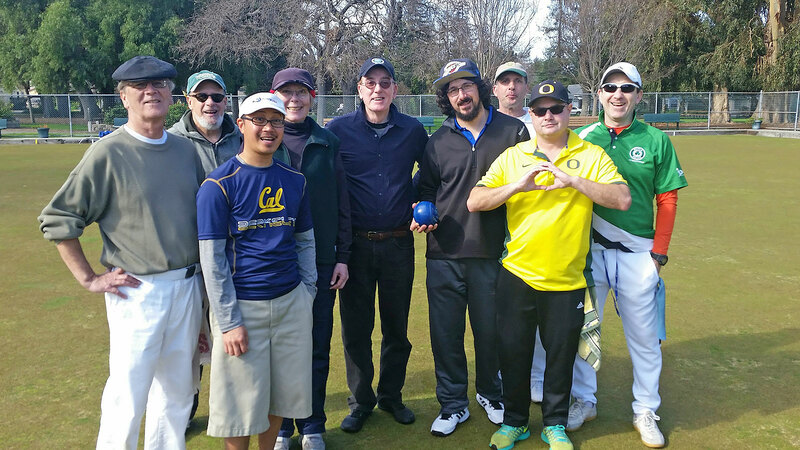 This year, as before, the tournament attracted bowlers from all over the Bay Area, but Berkeley fielded easily the largest number from a single club, with almost a third—nine out of 28—of the entrants. And perhaps even more impressive, Berkeley teams ended up taking three of the four top spots. The tournament, which was held at the Sunnyvale club, was organized as a 13-game round robin, there being 14 teams in total, and was played over three weekends in January. 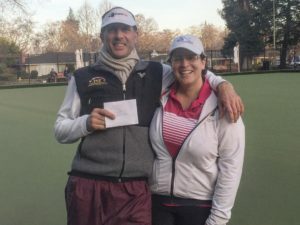 Unlike the last couple of years when the drought and mild temperatures made a bit of a mockery of the title, this year the event lived up to its billing as the Winter League. Rain jackets and extra layers were needed on the first couple of Saturdays, but the intermittent showers did not dampen the spirits of the participants or lessen their competitive urges. 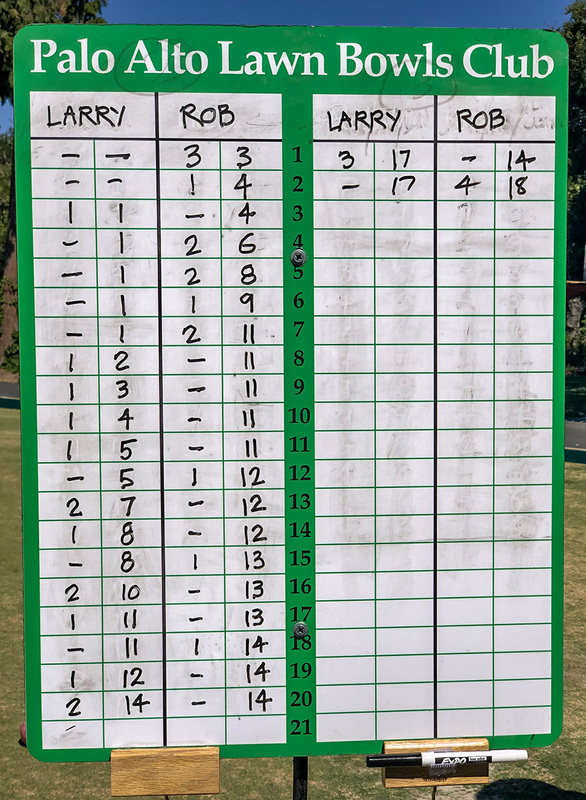 At the end of two weeks, the top spot was held by Frankie Napoli (a joint Rossmoor and Berkeley member) and his partner Dave Peters (Rossmoor) with Berkeley pairs Shawn Roney/Rob Hoey and Jim Corr/Bob Schwartz in hot pursuit. However, on the final Saturday, Frankie and Dave’s hitherto stellar mojo left them (they had lost only one game up to that point) and they faded in the stretch. 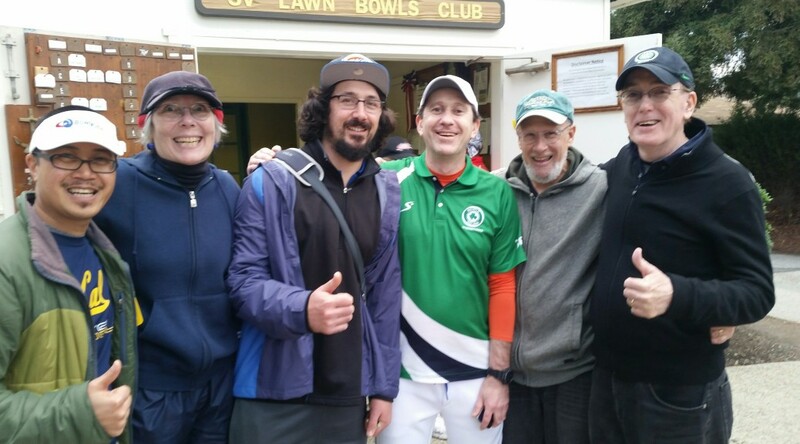 This allowed Shawn and Rob to edge into first place ahead of Jim and Bob by the narrowest of margins—one game point, gained when they held Ginger Harris and Janet Mednick (subbing for absent Mo Shooer) to a draw, while Jim and Bob lost to the same team. 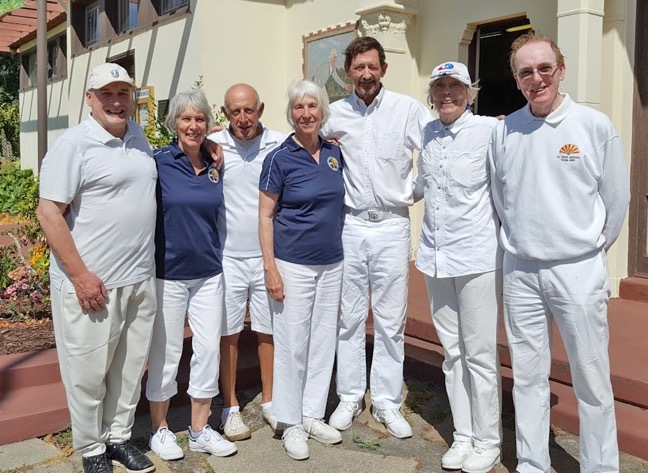 In the final standings, Shawn and Rob placed first, Jim and Bob second, and Berkeley duo Erwin Vista and Ann Brillhart sneaked past Frankie and Dave with a come-from-behind run to snag fourth place. Third was taken by Mario Giorgianni and Ron Marier of San Jose LBC. 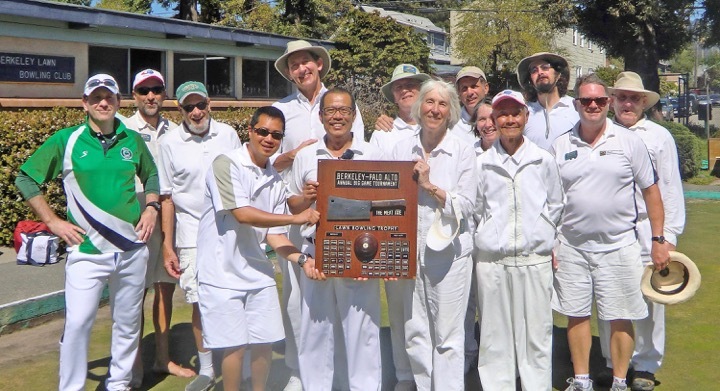 Congratulations to all the Berkeley bowlers, and thanks to all those who helped organize and maintain this event despite the fickle wintry season!